Being productive while working from home can sometimes be more of a challenge than you think. There are a number of possible distractions. When working for yourself as a business owner, you want to be effective and you desire to see results. 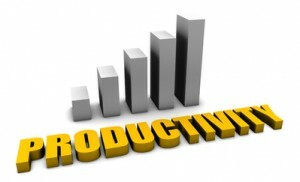 Productivity can be viewed as completion of tasks in a short amount of time without sacrificing quality of work. To maintain your standards of productivity, you’ll want to try to make your work environment as stress-free as possible. Let’s take a look at some ways that home-based business owners can maximize their work productivity and get the results they are looking for. If something within your work environment keeps grabbing your attention, you will find that your focus is decreased and you won’t be able to get a lot done. Eliminate any and all interruptions that you possibly can. Stick to a schedule and make a “to-do” list and stick to it. Set goals for your work day. Be committed to reaching those goals. Don’t let outside distractions get the best of you. If part of your work consists of taking phone calls or making phone calls, set aside time for doing just that. Plan your days and what it is you wish to accomplish on what day and what time frame. If you have deadlines that you are required to meet, work first on those tasks that have a fast approaching deadline. Try to cut down time spent on emails, and set times that you will be checking your email. If you are constantly interrupted by incoming emails that you have to answer right then, it will begin to take away from your ability to stay focused on your work. Inform clients and others what your available hours are. Stay away from social sites unless working on your social media campaign. These sites can be very time-consuming and before you know it, your work day will be over and you will discover you haven’t gotten near as much done as you intended. Take control of your mindset and make sure you get it right. Be in the work mode and be committed to being productive. It really is mind over matter. This is your time to prove what you can do. When at your desk for work purposes, you need to be clear minded, focused and committed to completing your tasks for the day. This is probably one of the most important things you can do in order to maximize your productivity. An uncomfortable, messy, disorganized workstation can be a huge hindrance to your productivity. If you are comfortable and you know where everything is, you will be saving a lot of time and won’t mind sitting there completing your work because your chair feels awesome and all of your necessary tools are right where they should be!